William Lyon Mackenzie King OM, CMG, PC (December 17, 1874 – July 22, 1950), also commonly known as Mackenzie King, was the dominant Canadian political leader from the 1920s through the 1940s. He served as the tenth prime minister of Canada in 1921–1926, 1926–1930 and 1935–1948. He is best known for his leadership of Canada throughout the Second World War (1939–1945) when he mobilized Canadian money, supplies and volunteers to support Britain while boosting the economy and maintaining morale on the home front. A Liberal with 21 years and 154 days in office, he was the longest-serving prime minister in Canadian history. Trained in law and social work, he was keenly interested in the human condition (as a boy, his motto was "Help those that cannot help themselves"), and played a major role in laying the foundations of the Canadian welfare state. King acceded to the leadership of the Liberal Party in 1919. Taking the helm of a party bitterly torn apart during the First World War, he reconciled factions, unifying the Liberal Party and leading it to victory in the 1921 election. His party was out of office during the harshest days of the Great Depression in Canada, 1930–35; he returned when the economy was on an upswing. He personally handled complex relations with the Prairie Provinces, while his top aides Ernest Lapointe and Louis St. Laurent skillfully met the demands of French Canadians. During the Second World War, he carefully avoided the battles over conscription, patriotism and ethnicity that had divided Canada so deeply in the First World War. Though few major policy innovations took place during his premiership, he was able to synthesize and pass a number of measures that had reached a level of broad national support. Scholars attribute King's long tenure as party leader to his wide range of skills that were appropriate to Canada's needs. He understood the workings of capital and labour. Keenly sensitive to the nuances of public policy, he was a workaholic with a shrewd and penetrating intelligence and a profound understanding of the complexities of Canadian society. A modernizing technocrat who regarded managerial mediation as essential to an industrial society, he wanted his Liberal Party to represent liberal corporatism to create social harmony. King worked to bring compromise and harmony to many competing and feuding elements, using politics and government action as his instrument. He led his party for 29 years, and established Canada's international reputation as a middle power fully committed to world order. King's biographers agree on the personal characteristics that made him distinctive. He lacked the charisma of such contemporaries as Franklin Roosevelt, Winston Churchill, or Charles de Gaulle. He lacked a commanding presence or oratorical skill; his best writing was academic, and did not resonate with the electorate. Cold and tactless in human relations, he had many political allies but very few close personal friends. He never married and lacked a hostess whose charm could substitute for his chill. He kept secret his beliefs in spiritualism and use of mediums to stay in contact with departed associates and particularly with his mother, and allowed his intense spirituality to distort his understanding of Adolf Hitler throughout the late 1930s. A survey of scholars in 1997 by Maclean's magazine ranked King first among all Canada's prime ministers, ahead of Sir John A. Macdonald and Sir Wilfrid Laurier. As historian Jack Granatstein notes, "the scholars expressed little admiration for King the man but offered unbounded admiration for his political skills and attention to Canadian unity." On the other hand, political scientist Ian Stewart in 2007 found that even Liberal activists have but a dim memory of him. King was born in Berlin, Ontario (now known as Kitchener), to John King and Isabel Grace Mackenzie. His maternal grandfather was William Lyon Mackenzie, first mayor of Toronto and leader of the Upper Canada Rebellion in 1837. His father was a lawyer, and later a professor at Osgoode Hall Law School. King had three siblings. [Note 1] He attended Berlin Central School (now Suddaby Public School) and Berlin High School (now Kitchener-Waterloo Collegiate and Vocational School). Tutors were hired to teach him more politics, science, math, English and French. His father was a lawyer with a struggling practice in a small city, and never enjoyed financial security. His parents lived a life of shabby gentility, employing servants and tutors they could scarcely afford, although their financial situation improved somewhat following a move to Toronto around 1890, where King lived with them for several years in a duplex located on Beverley Street while studying at the University of Toronto. King became a lifelong practising Presbyterian with a dedication to applying Christian virtues to social issues in the style of the Social Gospel. He never favoured socialism. King earned five university degrees. He obtained three degrees from the University of Toronto: B.A. 1895, LL.B. 1896 and M.A. 1897; he earned his LL.B. in 1896 from Osgoode Hall Law School. [Note 2] While studying in Toronto he met a wide circle of friends, many of whom became prominent. He was an early member and officer of the Kappa Alpha Society, which included a number of these individuals (two future Ontario Supreme Court Justices and the future Chairman of the University itself). It encouraged debate on political ideas. He also met Arthur Meighen, a future political rival; the two men did not get on especially well from the start. King was especially concerned with issues of social welfare and was influenced by the settlement house movement pioneered by Toynbee Hall in London, England. He played a central role in fomenting a students' strike at the university in 1895. He was in close touch, behind the scenes, with Vice-Chancellor William Mulock, for whom the strike provided a chance to embarrass his rivals Chancellor Edward Blake and President James Loudon. King failed to gain his immediate objective, a teaching position at the University, but earned political credit with Mulock, the man who would invite him to Ottawa and make him a deputy minister only five years later. While studying at the University of Toronto, King also contributed to the campus newspaper The Varsity. That Canada should desire to restrict immigration from the Orient is regarded as natural, that Canada should remain a white man's country is believed to be not only desirable for economic and social reasons but highly necessary on political and national grounds. He is the only Canadian Prime Minister to have earned a PhD. King was appointed in 1900 as Deputy Minister at the head of the Canadian government's new department of Labour, and became active in policy domains from Japanese immigration to railways, notably the Industrial Disputes Investigations Act (1907) which sought to avert labour strikes by prior conciliation. In 1901, King's roommate and best friend, Henry Albert Harper, died heroically during a skating party when a young woman fell through the ice of the partly frozen Ottawa River. Harper dove into the water to try to save her, and perished in the attempt. King led the effort to raise a memorial to Harper, which resulted in the erection of the Sir Galahad statue on Parliament Hill in 1905. In 1906, King published a memoir of Harper, entitled The Secret of Heroism. He was first elected to Parliament as a Liberal in a 1908 by-election, and then in 1909 was appointed as the first-ever Minister of Labour. King's term as Minister of Labour was marked by two significant achievements. He led the passage of the Industrial Disputes Investigation Act and the Combines Investigation Act, which he had shaped during his civil and parliamentary service. The legislation significantly improved the financial situation for millions of Canadian workers. He lost his seat in the 1911 general election, which saw the Conservatives defeat his Liberals. After his defeat, King went on the lecture circuit on behalf of the Liberal Party. In June 1914 John D. Rockefeller Jr. hired him at the Rockefeller Foundation in New York City, to head its new Department of Industrial Research. It paid $12,000 per year, compared to the meagre $2,500 per year the Liberal Party was paying. He worked for the Foundation until 1918, forming a close working association and friendship with Rockefeller, advising him through the turbulent period of the 1914 strike and Ludlow massacre at a family-owned coal company in Colorado, which subsequently set the stage for a new era in labour management in America. King became one of the earliest expert practitioners in the emerging field of industrial relations. King was not a pacifist, but he showed little enthusiasm for the Great War; he faced criticism for not serving in Canada's military and instead working for the Rockefellers. But he was nearly 40 years old when the war began, and was not in good physical condition. He never gave up his Ottawa home, and travelled to the United States on an as-needed basis, performing valuable service by helping to keep war-related industries running smoothly. In 1918 King, assisted by his friend F. A. McGregor, published the far-sighted book Industry and Humanity: A Study in the Principles Underlying Industrial Reconstruction, a dense, abstract work he wrote in response to the Ludlow massacre. It went over the heads of most readers, but revealed the practical idealism behind King's political thinking. He emphasized that capital and labour were natural allies, not foes, and that the community at large (represented by the government) should be the third and decisive party in industrial disputes. He expressed derision for syndicates and trades unions, chastising them for aiming at the "destruction by force of existing organization, and the transfer of industrial capital from the present possessors" to themselves. Quitting the Rockefeller Foundation in February 1918, King became an independent consultant on labour issues for the next two years, earning $1,000 per week from leading American corporations. Even so, he kept his official residence in Ottawa, hoping for a call to duty. In 1917, Canada was in crisis; King supported Liberal leader Sir Wilfrid Laurier in his opposition to conscription, which was violently opposed in the province of Quebec. The Liberal party became deeply split, with most Anglophones joining in the pro-conscription Union government, a coalition controlled by the Conservatives under Prime Minister Sir Robert Borden. King returned to Canada to run in the 1917 election, which focused almost entirely on the conscription issue. Unable to overcome a landslide against Laurier, King lost in the constituency of North York, which his grandfather had once represented. King was Laurier's chosen successor as leader of the Liberal Party, but it was deeply divided by Quebec's total opposition to conscription and the agrarian revolt in Ontario and the Prairies. Levin argues that when King returned to politics in 1919, he was a rusty outsider with a weak base facing a nation bitterly split by language, regionalism and class. He outmaneuvered more senior competitors by embracing Laurier's legacy, championing labour interests, calling for welfare reform, and offering solid opposition to the Conservative enemy. When Laurier died in 1919, King was elected leader in the first Liberal leadership convention, defeating his four rivals on the fourth ballot. He won thanks to the support of the Quebec bloc, organized by his long-time lieutenant in Quebec, Ernest Lapointe (1876–1941). King could not speak French and had minimal interest in Quebec, but in election after election for the next 20 years (save for 1930), Lapointe produced the critical seats to give the Liberals control of the Commons. He was almost co-Prime Minister with King until his death in 1941. Once he became the Liberal leader in 1919 he paid closer attention to the Prairies, a fast-developing region. With a highly romanticized view he envisioned the pioneers as morally sound, hardworking individuals who lived close to nature and to God. The reform ferment in the region meshed with his self-image as a social reformer and fighter for the "people" against the "interests". Viewing a glorious sunrise in Alberta in 1920, he wrote in his diary, "I thought of the New Day, the New Social Order. It seems like Heaven's prophecy of the dawn of a new era, revealed to me." Pragmatism played a role as well, since his party depended for its survival on the votes of Progressive Party members of parliament who represented farmers in Ontario and the Prairies. He convinced many Progressives to return to the Liberal fold. In the 1921 election, his party defeated Arthur Meighen and the Conservatives, and he became Prime Minister. King's Liberals originally had a bare majority position, however, since they had won 118 out of 235 seats, exactly the minimum for a majority. The Conservatives won 49, the newly formed Progressive Party won 58 (but declined to form the official Opposition), and the remaining ten seats went to fringe parties and Independents; most of these ten supported the Progressives. As Prime Minister of Canada, King was appointed to the Privy Council of the United Kingdom on 20 June 1922 and was sworn at Buckingham Palace on 11 October 1923, during the 1923 Imperial Conference. During his first term of office, from 1921 to 1926, King pursued a conservative domestic policy with the object of lowering wartime taxes and, especially, wartime ethnic and labour tensions. "The War is over", he argued, "and for a long time to come it is going to take all that the energies of man can do to bridge the chasm and heal the wounds which the War has made in our social life." He sought a Canadian voice independent of London in foreign affairs. In September 1922 the British Prime Minister, David Lloyd George, appealed repeatedly to King for Canadian support in the Chanak crisis, in which a war threatened between Britain and Turkey. King coldly replied that the Canadian Parliament would decide what policy to follow, making clear it would not be bound by London's suggestions; the crisis soon dissipated, but the episode led to the downfall of Lloyd George. Despite prolonged negotiations, King was unable to attract the Progressives into his government, but once Parliament opened, he relied on their support to defeat non-confidence motions from the Conservatives. King was opposed in some policies by the Progressives, who opposed the high tariffs of the National Policy. King faced a delicate balancing act of reducing tariffs enough to please the Prairie-based Progressives, but not too much to alienate his vital support in industrial Ontario and Quebec, who perceived tariffs were necessary to compete with American imports. King and Conservative leader Arthur Meighen sparred bitterly in Commons debates, and the decades-long rivalry between the two was among the nastiest in the history of Canadian politics. Despite their university-days acquaintance, their personalities and working methods contrasted enormously in almost every respect. As King's term wore on, the Progressives gradually weakened. Their effective and passionate leader, Thomas Crerar, resigned to return to his grain business, and was replaced by the more placid Robert Forke. Socialist reformer J. S. Woodsworth gradually gained influence and power, and King was able to reach an accommodation with him on policy matters. In any event, the Progressive caucus lacked the party discipline that was traditionally enforced by the Liberals and Conservatives. The Progressives had campaigned on a promise that their MP's would represent their constituents first. King used this to his advantage, as he could always count on at least a handful of Progressive MP's to shore up his near-majority position for any crucial vote. In 1923 King government passed the Chinese Immigration Act, 1923 banning most forms of Chinese immigration to Canada. Immigration from most countries was controlled or restricted in some way, but only the Chinese were so completely prohibited from immigrating. This was after various members of the federal and some provincial governments (especially British Columbia) put pressure on the federal government to discourage Chinese immigration. King had a long-standing concern with city planning and the development of the national capital, since he had been trained in the settlement house movement and envisioned town planning and garden cities as a component of his broader program of social reform. He drew on four broad traditions in early North American planning: social planning, the Parks Movement, the City Scientific, and the City Beautiful. King's greatest impact was as the political champion for the planning and development of Ottawa, Canada's national capital. His plans, much of which were completed in the two decades after his death, were part of a century of federal planning that repositioned Ottawa as a national space in the City Beautiful style. Confederation Square, for example, was initially planned to be a civic plaza to balance the nearby federal presence of Parliament Hill. The Great War monument was not installed until the 1939 royal visit, and King intended that the replanning of the capital would be the World War I memorial. However, the symbolic meaning of the World War I monument gradually expanded to become the place of remembrance for all Canadian war sacrifices. In 1926 King, facing a House of Commons vote connected to the customs scandal that could force his government to resign, advised the Governor General, Lord Byng, to dissolve Parliament and call another election, but Byng refused, the only time in Canadian history that the Governor General has exercised such a power. Instead Byng called upon Conservative Party leader Arthur Meighen to form a government. Meighen attempted to do so, but was unable to obtain a majority in the Commons and he, too, advised dissolution, which this time was accepted. The episode marks a constitutional crisis that was resolved by a tradition of non-interference in Canadian political affairs on the part of the British government. In the ensuing Canadian federal election, 1926, King appealed for public support of the constitutional principle that the Governor General must accept the advice of his ministers, though this principle was at most only customary. The Liberals argued that the Governor General had interfered in politics and shown favour to one party over another. King and his party won the election with a plurality of seats in the Commons: 116 seats to the Conservatives' 91 in a 245-member House. 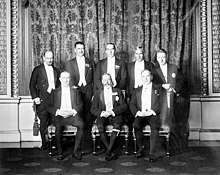 The constitutional crisis of 1926 provoked a consideration of the constitutional relations between the self-governing dominions and the British government. During the next five years the position of the Governor General of a Dominion was clarified; he ceased to be a representative of the British government and became a representative of The Crown. The independent position of the Dominions in the British Empire (later the Commonwealth) and in the international community was put on a firm foundation by the Balfour Declaration of 1926, subsequently codified in the Statute of Westminster (1931). King expanded the Department of External Affairs, founded in 1909, to further promote Canadian autonomy from Britain. The new department took some time to develop, but over time it significantly increased the reach and projection of Canadian diplomacy. Prior to this, Canada had relied on British diplomats who owed their first loyalty to London. King recruited many high-calibre people for the new venture, including future prime minister Lester Pearson and influential career administrators Norman Robertson and Hume Wrong. This project was a key element of his overall strategy, setting Canada on a course independent of Britain, of former colonizer France, as well as of the neighbouring powerful United States. In domestic affairs King strengthened the Liberal policy of increasing the powers of the provincial governments by transferring to the governments of Manitoba, Alberta, and Saskatchewan the ownership of the crown lands within those provinces, as well as the subsoil rights; these in particular would become increasingly important, as petroleum and other natural resources proved very abundant. In collaboration with the provincial governments, he inaugurated a system of old-age pensions based on need. In February 1930, he appointed Cairine Wilson as the first female senator in Canadian history. His government was in power during the beginning of the Great Depression, but was slow to respond to the mounting crisis. He felt that the crisis was a temporary swing of the business cycle and that the economy would soon recover without government intervention. Critics said he was out of touch. Just prior to the election, King carelessly remarked that he "would not give a five-cent piece" to Tory provincial governments for unemployment relief. The opposition made this remark a catch-phrase; the main issue was the deterioration in the economy and whether the prime minister was out of touch with the hardships of ordinary people. The Liberals lost the election of 1930 to the Conservative Party, led by Richard Bedford Bennett. The popular vote was very close between the two parties, with the Liberals actually earning more votes than in 1926, but the Conservatives had a geographical advantage that turned into enough seats to give a majority. After his loss, King stayed on as Opposition Leader, where it was his policy to refrain from offering advice or alternative policies. Indeed, his policy preferences were not much different from Bennett's, and he let the Conservative government have its way. Though he gave the impression of sympathy with progressive and liberal causes, he had no enthusiasm for the New Deal of American President Franklin D. Roosevelt (which Bennett eventually tried to emulate, after floundering without solutions for several years), and he never advocated massive government action to alleviate depression in Canada. Upon his return to office in October 1935, however, King seemed to demonstrate a commitment (like Franklin Roosevelt) to the underprivileged, speaking of a new era where "poverty and adversity, want and misery are the enemies which Liberalism will seek to banish from the land". In the 1935 election the Liberals used the slogan "King or Chaos" to win a landslide victory. For the first time in his political career, King led an undisputed Liberal majority government. Promising a much-desired trade treaty with the U.S., the King government passed the 1935 Reciprocal Trade Agreement. It marked the turning point in Canadian-American economic relations, reversing the disastrous trade war of 1930–31, lowering tariffs, and yielding a dramatic increase in trade. More subtly, it revealed to the prime minister and President Roosevelt that they could work together well. The worst of the Depression had passed by 1935 when King regained power. He implemented relief programs such as the National Housing Act and National Employment Commission. His government also made the Canadian Broadcasting Corporation a crown corporation in 1936, created Trans-Canada Airlines (the precursor to Air Canada) in 1937, and formed the National Film Board of Canada in 1939. In 1938, he transformed the Bank of Canada from a private entity to a crown corporation. After 1936 the prime minister lost patience when western Canadians preferred radical alternatives such as the CCF (Co-operative Commonwealth Federation) and Social Credit to his middle-of-the-road liberalism. Indeed, he came close to writing off the region with his comment that the prairie dust bowl was "part of the U.S. desert area. I doubt if it will be of any real use again." Instead he paid more attention to the industrial regions and the needs of Ontario and Quebec, particularly with respect to the proposed St. Lawrence Seaway project with the United States. As for the unemployed, he was hostile to federal relief, and only reluctantly accepted a Keynesian solution that involved federal deficit spending, tax cuts and subsidies to the housing market. Over the next fourteen years, a wide range of reforms similar to those association with the New Deal were realized during Mackenzie King's last period in office as Prime Minister. In 1939, compulsory contributions for pensions for low-income widows and orphans were introduced (although these only covered the regularly employed) while depressed farmers were subsidized from that same year onwards. In 1944, family allowances were introduced, and from 1948 the federal government subsidized medical services in the provinces. The various provinces were assisted by the Federal Unemployment and Agricultural Assistance Act of 1938 and the Youth Training Act of 1939 to create training programs for young persons, while an amendment to the Criminal Code (which received Royal assent in May 1939) provided against refusal to hire, or dismissal, "solely because of a person's membership in a lawful trade-union or association". In 1937, the age for blind persons to qualify for old-age pensions was reduced to 40 in 1937, and later to 21 in 1947. The Federal Home Improvement Plan of 1937 provided subsidized rates of interest on rehabilitation loans to 66,900 homes, while the National Housing Act of 1938 made provision for the building of low-rent housing. Another Housing Act was later passed in 1944 with the intention of providing federally guaranteed loans or mortgages to individuals who wished to repair or construct dwellings through their own initiative. The Vocational Training Co-ordination Act of 1942 provided an impetus to the provinces to set up facilities for postsecondary vocational training, and in 1948 the Industrial Relations and Disputes Investigation Act was passed, which safeguarded the rights of workers to join unions while requiring employers to recognize unions chosen by their employees. In March 1936, in response to the German remilitarization of the Rhineland, King had the Canadian High Commissioner in London inform the British government that if Britain went to war with Germany over the Rhineland issue, Canada would remain neutral. In June 1937, during an Imperial Conference of all the Dominion Prime Ministers in London, King informed British Prime Minister Neville Chamberlain that Canada would only go to war if Britain were directly attacked, and that if Britain were to become involved in a continental war then Chamberlain was not to expect Canadian support. In 1937, King visited Germany and met with Adolf Hitler. Possessing a religious yearning for direct insight into the hidden mysteries of life and the universe, and strongly influenced by the operas of Richard Wagner (who was also Hitler's favourite composer), King decided Hitler was akin to mythical Wagnerian heroes within whom good and evil were struggling. He thought that good would eventually triumph and Hitler would redeem his people and lead them to a harmonious, uplifting future. These spiritual attitudes not only guided Canada's relations with Hitler but gave the prime minister the comforting sense of a higher mission, that of helping to lead Hitler to peace. King commented in his journal that "he is really one who truly loves his fellow-men, and his country, and would make any sacrifice for their good". He forecast that "the world will yet come to see a very great man–mystic in Hitler ... I cannot abide in Nazism – the regimentation – cruelty – oppression of Jews – attitude towards religion, etc., but Hitler ... will rank some day with Joan of Arc among the deliverers of his people." In late 1938, during the great crisis in Europe over Czechoslovakia that culminated in the Munich Agreement, Canadians were divided. Francophones insisted on neutrality, as did some top advisers like Oscar D. Skelton. Imperialists stood behind Britain and were willing to fight Germany. King, who served as his own secretary of state for external affairs (foreign minister), said privately that if he had to choose he would not be neutral, but he made no public statement. All of Canada was relieved that the British appeasement at Munich, while sacrificing the rights of Czechoslovakia, seemed to bring peace. While Deputy Minister of Labour, King was appointed to investigate the causes of and claims for compensation resulting from the 1907 Asiatic Exclusion League riots in Vancouver's Chinatown and Japantown. One of the claims for damages came from Chinese opium dealers, which led King to investigate narcotics use in Vancouver, British Columbia. Following the investigation King reported that white women were also opium users, not just Chinese men, and the federal government used the report to justify the first legislation outlawing narcotics in Canada. The report failed to include any reference regarding the Opium Wars, the involvement of the East Indian Trading company, or the official Chinese government's resistance to the opium trade which was renewed on September 20, 1906. Under King's administration, the Canadian government, responding to strong public opinion, especially in Quebec, refused to expand immigration opportunities for Jewish refugees from Europe. In June 1939 Canada, along with Cuba and the United States, refused to allow entry for the 900 Jewish refugees aboard the passenger ship MS St. Louis. King realized the likelihood of World War II and began mobilizing on August 25, 1939, with full mobilization on September 1, 1939, the day Germany invaded Poland. In 1914, Canada was at the war by virtue of King George V's declaration. In 1939, the Prime Minister asserted Canada's autonomy and convened the House of Commons on September 7, nearly a month ahead of schedule, to discuss the government's intention to enter the war, which was approved two days later. On September 10, Prime Minister King, through his High Commissioner in London, issued a request to King George VI, asking him, in his capacity as King of Canada, to declare war against Germany. 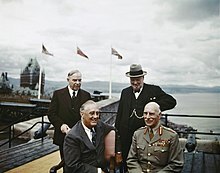 King linked Canada more and more closely to the United States, signing an agreement with Roosevelt at Ogdensburg, New York in August 1940 that provided for the close cooperation of Canadian and American forces, despite the fact that the U.S. remained officially neutral until the bombing of Pearl Harbor on December 7, 1941. During the war the Americans took virtual control of the Yukon and the then-British colony of Newfoundland in building the Alaska Highway and major airbases. King—and Canada—were largely ignored by Winston Churchill, despite Canada's major role in supplying food, raw materials, munitions and money to the hard-pressed British economy, training airmen for the Commonwealth, guarding the western half of the North Atlantic Ocean against German U-boats, and providing combat troops for the invasions of Italy, France and Germany in 1943–45. King proved highly successful in mobilizing the economy for war, with impressive results in industrial and agricultural output. The depression ended, prosperity returned, and Canada's economy expanded significantly. On the political side, King rejected any notion of a government of national unity. He held the Canadian federal election, 1940 as normally scheduled, despite the ongoing World War, unlike Britain, which formed a government of national unity and did not hold a wartime election. To re-arm Canada he built the Royal Canadian Air Force as a viable military power, while at the same time keeping it separate from Britain's Royal Air Force. He was instrumental in obtaining the British Commonwealth Air Training Plan Agreement, which was signed in Ottawa in December 1939, binding Canada, Britain, New Zealand and Australia to a program that eventually trained half the airmen from those four nations in the Second World War. King's government greatly expanded the role of the National Research Council of Canada during the war, moving into full-scale research in nuclear physics and commercial use of nuclear power in the following years. King, with C. D. Howe acting as point man, moved the nuclear group from Montreal to Chalk River, Ontario in 1944, with the establishment of Chalk River Nuclear Laboratories and the residential town of Deep River, Ontario. Canada became a world leader in this field, with the NRX reactor becoming operational in 1947; at the time, NRX was the only operational nuclear reactor outside the United States. The NRC also contributed to wartime scientific development in other ways during this period. King's promise not to impose conscription contributed to the defeat of Maurice Duplessis's Union Nationale Quebec provincial government in 1939 and the Liberals' re-election in the 1940 election. But after the fall of France in 1940, Canada introduced conscription for home service. Still, only volunteers were to be sent overseas. King wanted to avoid a repeat of the Conscription Crisis of 1917. By 1942, the military was pressing King hard to send conscripts to Europe. In 1942, King held a national plebiscite on the issue, asking the nation to relieve him of the commitment he had made during the election campaign. In the House of Commons on June 10, 1942, he said that his policy was "not necessarily conscription but conscription if necessary". French Canadians voted against conscription, with over 70% opposed, but an overwhelming majority – over 80% – of English Canadians supported it. French and English conscripts were sent to fight in the Aleutian Islands in 1943 – technically North American soil and therefore not "overseas" – but the mix of Canadian volunteers and draftees found that the Japanese troops had fled before their arrival. Otherwise, King continued with a campaign to recruit volunteers, hoping to address the problem with the shortage of troops caused by heavy losses in the Dieppe Raid in 1942, in Italy in 1943, and after the Battle of Normandy in 1944. In November 1944, the Government decided it was necessary to send conscripts to Europe for the war. This led to a brief political crisis (see Conscription Crisis of 1944) and a mutiny by conscripts posted in British Columbia, but the war ended a few months later. Over 15,000 conscripts went to Europe, though only a few hundred saw combat. Following the Attack on Pearl Harbor in December 1941, Japanese Canadians were categorized as enemy aliens under the War Measures Act, which began to remove their personal rights. Starting on December 8, 1941, 1,200 Japanese-Canadian-owned fishing vessels were impounded as a "defence measure." On January 14, 1942, the federal government passed an order calling for the removal of male Japanese nationals between 18 and 45 years of age from a designated protected area of 100 miles inland from the British Columbia coast, enacted a ban against Japanese-Canadian fishing during the war, banned shortwave radios and controlled the sale of gasoline and dynamite to Japanese Canadians. Japanese nationals removed from the coast after the January 14 order were sent to road camps around Jasper, Alberta. Three weeks later, on February 19, 1942, US President Franklin D. Roosevelt signed Executive Order 9066, which called for the removal of 110,000 people of Japanese ancestry from the American coastline. A historian of internment, Ann Sunahara, argues that "the American action sealed the fate of Japanese Canadians." On February 24, the federal government passed order-in-council PC 1468 which allowed for the removal of "all persons of Japanese origin" This order-in-council allowed the Minister of Justice the broad powers of removing people from any protected area in Canada, but was meant for Japanese Canadians on the Pacific coast in particular. On February 25, the federal government announced that Japanese Canadians were being moved for reasons of national security. In all, some 27,000 people were detained without charge or trial, and their property confiscated. Others were deported to Japan. King and his Cabinet ignored reports from the Royal Canadian Mounted Police and Canadian military that most of the Japanese were law-abiding and not a threat. Major General Ken Stuart told Ottawa, "I cannot see that the Japanese Canadians constitute the slightest menace to national security." King's political direction on this issue closely followed postulates from his 1909 doctoral thesis at Harvard. On September 22, 1988, Prime Minister Brian Mulroney delivered an apology for the internment, and the Canadian government announced a compensation package. Throughout his tenure, King led Canada from a colony with responsible government to an autonomous nation within the British Commonwealth. King asserted Canadian autonomy against the British government's attempts to turn the Commonwealth into an alliance. His biographer asserts that "in this struggle MacKenzie King was the constant aggressor". The Canadian High Commissioner to Britain, Vincent Massey, claimed that an "anti-British bias" was "one of the most powerful factors in his make-up". Anything like centralization in London, to say nothing of a direct or indirect attempt on the part of those in office in Downing Street to tell the people of the Dominions what they should or should not do, and to dictate their duty in matters of foreign policy, is certain to prove just as injurious to the so-called 'imperial solidarity' as any attempt at interference in questions of purely domestic concern. If membership within the British Commonwealth means participation by the Dominions in any and every war in which Great Britain becomes involved, without consultation, conference, or agreement of any kind in advance, I can see no hope for an enduring relationship. King therefore went to the Imperial Conference of 1926 and argued for greater autonomy of the Dominions. This resulted in the Balfour Declaration 1926, which announced the equal status of all members of the British Commonwealth (as it was known then), including Britain. This eventually led to the Statute of Westminster 1931. The Canadian city of Hamilton hosted the first Empire Games in 1930; this competition later became known as the Commonwealth Games, and is held every four years. In the lead-up to World War II in 1939, King affirmed Canadian autonomy by saying that the Canadian Parliament would make the final decision on the issue of going to war. He reassured the pro-British Canadians that Parliament would surely decide that Canada would be at Britain's side if Great Britain was drawn into a major war. At the same time, he reassured those who were suspicious of British influence in Canada by promising that Canada would not participate in British colonial wars. His Quebec lieutenant, Ernest Lapointe, promised French-Canadians that the government would not introduce conscription; individual participation would be voluntary. In 1939, in a country which had seemed deeply divided, these promises made it possible for Parliament to agree almost unanimously to declare war. King played two roles. On the one hand, he told English Canadians that Canada would no doubt enter war if Britain did. On the other hand, he and his Quebec lieutenant Ernest Lapointe told French Canadians that Canada would only go to war if it was in the country's best interests. With the dual messages, King slowly led Canada toward war without causing strife between Canada's two main linguistic communities. As his final step in asserting Canada's autonomy, King ensured that the Canadian Parliament made its own declaration of war one week after Britain. During the war, Canada rapidly expanded its diplomatic missions abroad. 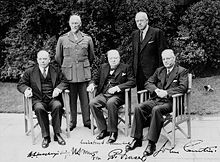 However British Prime Minister Winston Churchill made all the major military and diplomatic decisions for Canada and the other dominions, with minimal consultation. While Canada hosted two major Allied conferences in Quebec in 1943 and 1944, neither Mackenzie King nor his senior generals and admirals were invited to take part in any of the discussions. King's government introduced the Canadian Citizenship Act in 1946, which officially created the notion of "Canadian citizens". Prior to this, Canadians were considered British subjects living in Canada. On January 3, 1947, King received Canadian citizenship certificate number 0001. With the war winding down, King held a federal election in 1945 and won a minority, but formed a functioning coalition to continue governing. As King was defeated in his own riding of Prince Albert, fellow Liberal William MacDiarmid, who was re-elected in the safe seat of Glengarry, resigned so that a by-election could be held, which was subsequently won by King. The main opposition party Conservatives were weak for most of the two decades after R. B. Bennett lost the 1935 election, and King had virtually unchallenged power for much of his later years; this expanded still further during the War. He promoted engineer C. D. Howe into positions of great power and influence during the War, but was hit hard by the 1940 death of key minister and protege Norman McLeod Rogers. After this setback, and the 1941 death of his Quebec lieutenant Ernest Lapointe, King sought out the reluctant Louis St. Laurent, a leading Quebec lawyer, to take over Lapointe's role, and eventually persuaded St. Laurent to serve as a top aide. King helped found the United Nations in 1945 and attended the opening meetings in San Francisco. However, he became pessimistic about the organization's future possibilities. After the war, King quickly dismantled wartime controls. Unlike World War I, press censorship ended with the hostilities. He began an ambitious program of social programs and laid the groundwork for Newfoundland's later entry into Canada. King moved Canada into the deepening Cold War in alliance with the U.S. and Britain. He dealt with the espionage revelations of Soviet cipher clerk Igor Gouzenko, who defected in Ottawa in September 1945, by quickly appointing a Royal Commission to investigate Gouzenko's allegations of a Canadian Communist spy-ring transmitting top-secret documents to Moscow. External Affairs Minister Louis St. Laurent dealt decisively with this crisis, the first of its type in Canada's history. St. Laurent's leadership deepened King's respect, and helped make St. Laurent the next Canadian Prime Minister three years later. On January 20, 1948, King called on the Liberal Party to hold its first national convention since 1919 to choose a new leader. The August convention chose St. Laurent as the new leader of the Liberal Party. Three months later, King retired after 22 years as prime minister. King also had the most terms (six) as Prime Minister. Sir John A. Macdonald was second-in-line, with 19 years, as the longest-serving Prime Minister in Canadian history (1867–1873, 1878–1891). King was not charismatic and did not have a large personal following. Only eight Canadians in 100 picked him when the Canadian Gallup (CIPO) poll asked in September 1946, "What person living in any part of the world today do you admire?" Nevertheless, his Liberal Party was easily re-elected in the election of 1945. King died on July 22, 1950, at Kingsmere from pneumonia, with his retirement plans to write his memoirs unfulfilled. He is buried in Mount Pleasant Cemetery, Toronto. King lacked a commanding presence or oratorical skills; he did not shine on the radio or in newsreels. There was scant charisma. Cold and tactless in human relations, he had allies but very few close personal friends; he never married and lacked a hostess whose charm could substitute for his chill. His allies were annoyed by his constant intrigues. He is not remembered for great major policy innovations as prime minister. Christopher Moore says, "King had made 'Parliament will decide' his maxim, and he trotted it out whenever he wished to avoid a decision." He was keenly sensitive to the nuances of public policy; he was a workaholic with a shrewd and penetrating intelligence and a profound understanding of the complexities of Canadian society. His strength was apparent when he synthesized, built support for, and passed measures that had reached a level of broad national support. Advances in the welfare state were an example. His successors, especially Diefenbaker, Pearson, and Trudeau built the welfare state which he had advanced during the Second World War into the modern cradle-to-grave system. Scholars attribute King's long tenure as party leader to his wide range of skills that were appropriate to Canada's needs. King kept a very candid diary from 1893, when he was still an undergraduate, until a few days before his death in 1950; the volumes, stacked in a row, span a length of over seven metres and comprise over 50,000 manuscript pages of typed transcribed text. One biographer called these diaries "the most important single political document in twentieth-century Canadian history," for they explain motivations of the Canadian war efforts and describe other events in detail. King's occult interests were kept secret during his years in office, and only became publicized after his death when his diaries were opened. Readers were amazed. King communed with spirits, using seances with paid mediums. Thereby, he claimed to have communicated with Leonardo da Vinci, Wilfrid Laurier, his dead mother, his grandfather, and several of his dead dogs, as well as the spirit of the late President Roosevelt. Some historians argue that he sought personal reassurance from the spirit world, more than political advice. After his death, one of his mediums said that she had not realized that he was a politician. King did inquire whether his party would win the 1935 election, one of the few times politics came up during his seances. However Allan Levine argues that sometimes he did pay attention to the political implications of his seances: "All of his spiritualist experiences, his other superstitions and his multi-paranoid reactions imprinted on his consciousness, shaping his thoughts and feelings in a thousand different ways." Historians have seen in his spiritualism and occult activities a penchant for forging unities from antitheses, thus having latent political import. Historian C.P. Stacey, in his 1976 book A Very Double Life examined King's secret life in detail, argued that King did not allow his beliefs to influence his decisions on political matters. Stacey wrote that King entirely gave up his interests in the occult and spiritualism during World War II. King never married, but had several close female friends, including Joan Patteson, a married woman with whom he spent some of his leisure time; sometimes she served as hostess at his dinner parties. He did not have a wife who could be the hostess all the time and handle the many social obligations that he tried to downplay. Editor Charles Bowman reports that, "He felt the lack of a wife, particularly when social duties called for a hostess." Some historians have interpreted passages in his diaries as suggesting that King regularly had sexual relations with prostitutes. Others, also basing their claims on passages of his diaries, have suggested that King was in love with Lord Tweedsmuir, whom he had chosen for appointment as Governor General in 1935. Along with Wilfrid Laurier, King was the only other Canadian Prime Minister to be in office during the reigns of three Canadian Monarchs. King was ranked as the greatest Canadian Prime Minister by a survey of Canadian historians. He was named a Person of National Historic Significance in 1968. As the Prime Minister of Canada and an elected Member of the House of Commons of Canada, The Right Honourable William Lyon Mackenzie King, P.C., C.M.G., would be awarded the medal as a member of the Canadian order of precedence. King's likeness is on the Canadian fifty-dollar note since 1975. King left no published political memoirs, although his private diaries were extensively detailed. His main published work remains his 1918 book Industry and Humanity. Following the publication of King's diaries in the 1970s, several fictional works about him were published by Canadian writers. These included Elizabeth Gourlay's novel Isabel, Allan Stratton's play Rexy and Heather Robertson's trilogy Willie: A Romance (1983), Lily: A Rhapsody in Red (1986), and Igor: A Novel of Intrigue (1989). In 1998, there was controversy over King's exclusion from a memorial to the Quebec Conference, which was attended by King, Roosevelt, and Churchill. The monument was commissioned by the sovereigntist Parti Québécois government of Quebec, which justified the decision on their interpretation that King was acting merely as a host for the meeting between Roosevelt and Churchill. Canadian federalists, however, accused the government of Quebec of trying to advance their own political agenda. OC Transpo has a Transitway station named Mackenzie King due to its location on the Mackenzie King Bridge. It is located adjacent to the Rideau Centre in downtown Ottawa, Ontario. The bridge across the Rideau Canal in downtown Ottawa, built following World War II, is named in his honour to recognize his contributions to the land planning of the city of Ottawa. Part of his country retreat, now called Mackenzie King Estate, at Kingsmere in the Gatineau Park, near Ottawa, is open to the public. The house King died in, called "The Farm", is the official residence of the Speaker of the House of Commons of Canada, and is not part of the park. The Woodside National Historic Site in Kitchener, Ontario was King's boyhood home. The estate has over 4.65 hectares of garden and parkland for exploring and relaxing, and the house has been restored to reflect life during King's era. There is a MacKenzie King Public School in the Heritage Park neighbourhood in Kitchener. Kitchener was known as Berlin until 1916. King was mentioned in the book Alligator Pie by Dennis Lee, appearing as the subject of a nonsensical children's poem, which reads "William Lyon Mackenzie King / He sat in the middle and played with string / He loved his mother like anything / William Lyon Mackenzie King." King is a prominent character in Donald Jack's novel Me Too, set in Ottawa in the 1920s. A character who appeared twice in the popular 1990s Canadian television series Due South was named "Mackenzie King" in obvious reference. ^ Osgoode Hall, while then located close to the University of Toronto campus, was not formally associated with the University of Toronto. ^ Moscovitch, Allan (February 7, 2006). "Welfare State". The Canadian Encyclopedia (online ed.). Historica Canada. Retrieved June 9, 2011. ^ a b Neatby, H. Blair (1977). "King and the Historians". In English, John; Stubbs, J.O. (eds.). Mackenzie King: Widening the Debate. Macmillan of Canada. ^ Bliss, Michael (1994). Right Honourable Men: The Descent of Canadian Politics from MacDonald to Mulroney. Harper Collins. pp. 123–184. ^ Courtney, John C. (1976). "Prime Ministerial Character: An Examination of Mackenzie King's Political Leadership". Canadian Journal of Political Science. 9 (1): 77–100. doi:10.1017/S0008423900043195. ^ English, John; Stubbs, J.O., eds. (1977). Mackenzie King: Widening the Debate. Macmillan of Canada. ^ Granatstein, J. L. (1977). Mackenzie King: His life and world. McGraw-Hill Ryerson. ^ "William Lyon Mackenzie King: Prime Minister and Graduate". Great Past. University of Toronto. Retrieved December 7, 2011. ^ Dawson 1958, pp. 37–38. ^ Blackburn, Robert H. (1988). "Mackenzie King, William Mulock, James Mavor, and the University of Toronto Students' Revolt of 1895". Canadian Historical Review. 69 (4): 490–503. doi:10.3138/CHR-069-reviews. ^ Dawson 1958, pp. 198–199. ^ "Canadian Opinion of Immigrants". Quebec History. Marianopolis College. Retrieved May 5, 2012. ^ "PRIME MINISTERS OF CANADA Biographical Information". Parliament of Canada. Retrieved June 8, 2011. ^ Neatby, H. Blair (October 15, 2008). "William Lyon Mackenzie King". The Canadian Encyclopedia (online ed.). Historica Canada. Retrieved July 21, 2015. ^ Dawson 1958, pp. 129-131. ^ Dawson 1958, pp. 227–231. ^ Chernow, Ron (1998). Titan: The Life of John D. Rockefeller Sr. Random House. pp. -571–586. ISBN 0-6794-3808-4. ^ Dawson 1958, ch. 10. ^ Dawson 1958, pp. 248–251. ^ Cooper, Barry (1978–1979). "On Reading Industry and Humanity: a Study in the Rhetoric Underlying Liberal Management". Journal of Canadian Studies. 13 (4): 28–39. ISSN 0021-9495. ^ a b King, William Lyon Mackenzie (1918). Industry and Humanity: A Study in The Principles Underlying Industrial Reconstruction. Boston: Houghton Mifflin. pp. 494–495. ^ Dawson 1958, pp. 255–265. ^ Levine, Allan (2011). "Ch. 4". King: William Lyon Mackenzie King, A Life Guided by the Hand of Destiny. Vancouver: Douglas & MacIntyre. ISBN 1-7710-0068-6. ^ a b Betcherman, Lita-Rose (2002). Ernest Lapointe: Mackenzie King's Great Quebec Lieutenant. University of Toronto Press. p. 175. ISBN 978-0-8020-3575-2. ^ "Diaries of William Lyon Mackenzie King; Item #7452". Library and Archives Canada. October 12, 1920. Retrieved November 27, 2014. ^ a b Wardhaugh, Robert A. (2000). Mackenzie King and the Prairie West. University of Toronto Press. ISBN 0-8020-4733-5. ^ "No. 32721". The London Gazette. June 20, 1922. p. 4621. ^ "No. 32870". The London Gazette. October 12, 1923. p. 6817. ^ Dawson 1958, p. 294; Letter of May 5, 1919. ^ Dawson 1958, pp. 401–422. ^ Dawson 1958, 14, 15. ^ Hutchison (1952), pp. 76–78. ^ Esberey, J. E. (March 1973). "Personality and Politics: A New Look at the King-Byng Dispute". Canadian Journal of Political Science. 6 (1): 37–55. doi:10.1017/S0008423900037434. ^ "Electoral Results by Party". Parliament of Canada. Retrieved July 20, 2015. ^ Thompson, John Herd; Seager, Allan (1985). Canada 1922–1939. The Canadian Centenary Series. 15. McClelland & Stewart. ISBN 0-7710-8564-8. ^ Hilliker, John (1990). Canada's Department of External Affairs. The Early Years: 1909–1946. McGill-Queen's Press. ISBN 0-7735-0751-5. ^ English, John (1989). Shadow of Heaven: The Life of Lester Pearson. Vol. 1. Lester & Orpen Dennys. ISBN 0-8861-9169-6. ^ Neatby, H. Blair (1963). William Lyon Mackenzie King, 1924–1932: The Lonely Heights. Volume 2. Methuen & Co. ASIN B000LRH2N0. ^ Berton, Pierre (1990). The Great Depression, 1929–1939. McClelland & Stewart. pp. 54, 70. ISBN 0-7710-1270-5. ^ Raymond B. Blake (2009). From Rights to Needs: A History of Family Allowances in Canada, 1929-92. UBC Press. p. 33. ^ Neatby (1976), pp. 143–48. ^ "The Bank's History". Bank of Canada. Retrieved June 9, 2011. ^ Pennanen, Gary (March 1997). "Battle of the Titans: Mitchell Hepburn, Mackenzie King, Franklin Roosevelt, and the St. Lawrence Seaway". Ontario History. 89 (1): 1–21. ISSN 0030-2953. ^ Neatby, H. Blair (1972). The Politics of Chaos: Canada in the Thirties. Gage. pp. 84–86. ISBN 0-7715-5661-6. ^ "Introduction to Recreation and Leisure". ^ "MONTHLY LABOR REVIEW VOLUME 49: JULY TO DECEMBER 1939". ^ "Old Age Pensions and Policy-Making in Canada". ^ Ann McAfee. "Housing and Housing Policy". The Canadian Encyclopedia. ^ "Anabaptist/Mennonite Faith and Economics". ^ "Encyclopedia of the Great Plains". ^ "MOB! CAPE's mobilization bulletin". ^ Emmerson, James Thomas (1977). The Rhineland Crisis, March 7, 1936: A Study in Multilateral Diplomacy. Iowa State University Press. p. 144. ISBN 0-8138-1865-6. ^ Middlemas, Keith (1972). Diplomacy of Illusion: The British Government and Germany, 1937–1939. London: Weidenfeld and Nicolson. pp. 21–23. ISBN 0-2979-9390-9. ^ "Mackenzie King in Berlin". A Real Companion and Friend: The diary of William Lyon Mackenzie King. Library and Archives Canada. Archived from the original on October 31, 2009. Retrieved November 24, 2008. ^ Keyserlingk, Robert H. (1985–1986). "Mackenzie King's Spiritualism and His View of Hitler in 1939". Journal of Canadian Studies. 20 (4): 26–44. ISSN 0021-9495. ^ Stacey, C. P. (1980). "The Divine Mission: Mackenzie King and Hitler". Canadian Historical Review. 61 (4): 502–512. doi:10.3138/chr-061-04-03. ^ Alan Davies; Marilyn F. Nefsky (2010). How Silent Were the Churches? : Canadian Protestantism and the Jewish Plight during the Nazi Era. Wilfrid Laurier UP. pp. 76–77. ^ Fry, Michael Graham (1999). "The British Dominions and the Munich Crisis". In Goldstein, Erik; Lukes, Igor (eds.). The Munich Crisis, 1938. Psychology Press. pp. 320–325. ISBN 0-7146-4995-3. ^ Green, Melvyn (Winter 1979). "A History of Narcotics Control: The Formative Years". University of Toronto Law Review. 37 (1). ^ Tulchinsky, Gerald J. J. (1998). Branching Out: The Transformation of the Canadian Jewish Community. Stoddart. pp. 200–201. ISBN 0773730842. ^ Knowles, Valerie (2007). Strangers at Our Gates: Canadian Immigration and Immigration Policy, 1540–1997. Toronto: Dundurn. p. 144. ISBN 1-4597-1237-4. ^ Buckner, Phillip Alfred (2008). Canada and the British Empire. Oxford University Press. pp. 105–106. ISBN 0-1992-7164-X. ^ Perras, Galen Roger (1998). Franklin Roosevelt and the Origins of the Canadian-American Security Alliance, 1933–1945: Necessary, but Not Necessary Enough. Praeger. ISBN 0-2759-5500-1. ^ a b Stacey, C. P. (1970). Arms, Men and Governments: The War Policies of Canada, 1939–1945. Queen's Printer. ^ Bothwell, Robert (1988). Nucleus: The History of Atomic Energy of Canada Limited. University of Toronto Press. ISBN 0-8020-2670-2. ^ Sugiman, Pamela. "Life is Sweet: Vulnerability and Composure in the Wartime Narratives of Japanese Canadians". Journals of Canadian Studies. Winter 2009: 186-218, 262. ^ Sunahara, Ann. "The Politics of Racism: The Uprooting of Japanese Canadians During the Second World War." Toronto: J, Larimer, 1981.Pg 47-48. ^ Kobayashi, Audrey. "The Japanese-Canadian redress settlement and its implications for ‘race relations’" Canadian Ethnic Studies. Vol. 24, Issue 1. ^ Sunahara, Ann Gomer (1981). "The Politics of Racism: The Uprooting of Japanese Canadians During the Second World War" (PDF). Ottawa: James Lorimer. p. 23. ISBN 0-8886-2413-1. ^ Neatby (1963), Vol. 2, p. 32. ^ Vincent Massey, What's Past is Prologue (London: Macmillan, 1963), p. 242. ^ Dawson 1958, p. 409. ^ Dawson 1958, p. 419. ^ J. L. Granatstein, "Happily on the Margins: Mackenzie King and Canada at the Quebec Conferences," in David B. Woolner, ed., The Second Quebec Conference Revisited: Waging War, Formulating Peace: Canada, Great Britain, and the United States in 1944-1945 (1998) pp 49-64. ^ "The first officially Canadian citizens". CBC Archives. Canadian Broadcasting Corporation. March 22, 2010. Retrieved June 10, 2015. ^ Hutchison, Bruce (1964). Mr. Prime Minister 1867–1964. Toronto: Longmans Canada. ^ "The Right Honourable William Lyon Mackenzie King". Historic Sites and Monuments Board of Canada – Former Prime Ministers and Their Grave Sites. Parks Canada. February 24, 2011. Archived from the original on November 2, 2014. Retrieved June 10, 2015. ^ Terry Reardon (2012). Winston Churchill and Mackenzie King: So Similar, So Different. Dundurn. p. 381. ^ English, John; Stubbs, J.O., eds. (1977). Mackenzie King: Widening the Debate. Macmillan of Canada. ISBN 0-77051-529-0. ^ Christopher Moore (2011). 1867: How the Fathers Made a Deal. McClelland & Stewart. p. 222. ^ Allan Levine (2011). King: William Lyon Mackenzie King : a Life Guided by the Hand of Destiny. ^ Peter Neary; J. L. Granatstein (1999). The Veterans Charter and Post-World War II Canada. MQUP. p. 294. ^ "Diaries of William Lyon Mackenzie King". Library and Archives Canada. Library and Archives Canada. Retrieved April 17, 2018. ^ a b Mallinos, Chris (2018). "For King — and Laurier — and country". Canada's History. 97 (6): 70–71. ISSN 1920-9894. ^ Levine, Allan (1996). Scrum Wars: The Prime Ministers and the Media. Toronto, Ontario: Dundurn. p. 134. ISBN 978-1-5548-8289-2. Retrieved July 20, 2015. ^ Bowman, Charles A. (1966). Ottawa Editor: The Memoirs of Charles A. Bowman. Gray's Pub. ^ Jarvis, Ian; Collins, David (1992). Willie: Canada's Bachelor Prime Minister. Toronto, Ontario: Butterfly Productions. ^ King, William Lyon MacKenzie National Historic Person. Directory of Federal Heritage Designations. Parks Canada. ^ a b c d "The Canadian Honours System". ^ a b "Commemorative Medals of The Queen's Reign in Canada". ^ a b "Behind the Diary: The Private Becomes Public: The Impact of the Diary". A Real Companion and Friend: The Diary of William Lyon Mackenzie King. Library and Archives Canada. Archived from the original on May 10, 2012. Retrieved April 17, 2018. Bliss, Michael (1994). Right Honourable Men: The Descent of Canadian Politics from MacDonald to Mulroney. pp. 123–184. ISBN 978-1-4434-0342-9. Courtney, John C. (March 1976). "Prime Ministerial Character: An Examination of Mackenzie King's Political Leadership". Canadian Journal of Political Science. 9 (1): 77–100. doi:10.1017/s0008423900043195. JSTOR 3230872. English, John; Stubbs, J.O., eds. (1977). Mackenzie King: Widening the Debate. Macmillan of Canada. ISBN 0-7705-1529-0. 11 essays by scholars. Esberey, Joy E. (1980). Knight of the Holy Spirit: A Study of William Lyon Mackenzie King. University of Toronto Press. ISBN 0-8020-5502-8. ; a psychobiography stressing his spirituality. Ferns, Henry; Ostry, Bernard (1976). The Age of Mackenzie King. Toronto, Ontario: James Lorimer & Company. ISBN 0-8886-2115-9. ; a scholarly biography to 1919. Henderson, George F. (2015). W.L. Mackenzie King: A Bibliography and Research Guide. University of Toronto Press. ISBN 978-1-4426-5560-7. McGregor, Fred A. (1962). The Fall & Rise of Mackenzie King, 1911–1919. Toronto: Macmillan of Canada. Wardhaugh, Robert A. (1996). "A Marriage of Convenience? Mackenzie King and Prince Albert Constituency". Prairie Forum. 21 (2): 177–199. ; He represented the safe Saskatchewan district 1926–45; his goal was to disarm the Progressives. Whitaker, Reginald (1978–1979). "Political Thought and Political Action in Mackenzie King". Journal of Canadian Studies. 13 (4): 40–60. Allen, Ralph (1961). Ordeal by Fire: Canada, 1910–1945. Canadian History Series. Volume 5. Toronto, Ontario: Doubleday Canada. Cuff, R.D. and Granatstein, J.L. Canadian-American Relations in Wartime: From the Great War to the Cold War. (1975). 205 pp. Donaghy, Greg, ed. Canada and the Early Cold War, 1943–1957 (1998) online edition. Dziuban, Stanley W. Military Relations between the United States and Canada, 1939–1945 (1959) online edition. Eayrs, James. In Defence of Canada. 5 vols. 1964–1983. the standard history of defense policy. Esberey, J.B. "Personality and Politics: A New Look at the King-Byng Dispute," Canadian Journal of Political Science vol 6 no. 1 (March 1973), 37–55. Granatstein, J.L. Conscription in the Second World War, 1939–1945;: A study in political management (1969). Granatstein, J.L. and Norman Hillmer. Prime Ministers: Ranking Canada's Leaders, 1999, pp. 83–101. Macfarlane, John. "Double Vision: Ernest Lapointe, Mackenzie King and the Quebec Voice in Canadian Foreign Policy, 1935–1939," Journal of Canadian Studies 1999 34(1): 93–111; argues Lapointe guided the more imperialist Mackenzie King through three explosive situations: the Ethiopian crisis of 1935, the Munich crisis of 1938, and the formulation of Ottawa's 'no-neutrality-no-conscription' pact in 1939. Stacey, C. P. Canada and the Age of Conflict: Volume 2: 1921–1948; the Mackenzie King Era (U of Toronto Press 1981), ISBN 0-80-202397-5. Whitaker, Reginald. The Government Party: Organizing and Financing the Liberal Party of Canada, 1930–1958 (1977). The Canadian Annual Review of Public Affairs (annual, 1901–1938), full text for 1920 online and downloadable. Mackenzie King, W. L. Industry and Humanity: A Study in the Principles Under-Lying Industrial Reconstruction (1918) online edition; also full text online and downloadable. The diaries of William Lyon Mackenzie King, 50,000 pages, typescript; fully searchable. Pickersgill, J.W., and Donald F. Forster, The Mackenzie King Record. 4 vols. Vol. 1: 1939–1944 and Vol. 2: 1944–1945 (University of Toronto Press, 1960); and Vol. 3: 1945–1946 online and Vol. 4: 1946–1947 online (University of Toronto Press, 1970). Edited from King's private diary. Hou, Charles, and Cynthia Hou, eds. Great Canadian Political Cartoons, 1915 to 1945. (2002). 244pp. Brittain, Donald. The King Chronicles, National Film Board, 1988. Wikimedia Commons has media related to William Lyon Mackenzie King.